I was lucky to take part in a two-day residency as a member of a small group from Stoke-on-Trent at the Science Museum in London in November 2014 as part of the Pararchive project. The first day we were able to have a look around the museum's reserve collection in Blythe House which is not open to the public : we spent a few hours of the second day wandering around the public collection in Exhibition Road. I'm an industrial chemist and I also have an interest in mathematics and computing, so it was a real treat to have a look around this particular gallery. I selected two items which illustrate different computing methods : if Babbage had had more success, then we might have had steam-driven digital computers in the 19th century ! During the 19th century there was an ever-increasing need for more accurate mathematical tables which were required in all sorts of manufacturing industries as well as in scientific research. These had always been calculated by human beings using a mathematical technique known as the 'method of differences' which enabled the required values to be calculated using only addition and subtraction. Indeed, the original meaning of the word 'computer' was a person, often in an observatory, who was an expert in calculating complex mathematical functions using a variety shortcuts. Creating mathematical tables by hand was a slow process and human errors inevitably crept in. 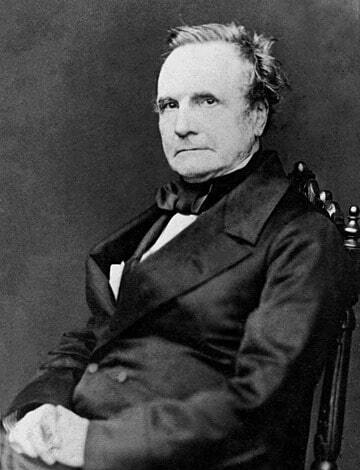 Babbage had the vision to realise that it might be possible to use the method of differences using a calculating machine and he produced a design in 1821 which was planned to operate at 16-digit precision - about the same as a modern scientific pocket calculator. The machine would have used about 25,000 parts and, unlike modern computers and calculators, would have worked internally in normal 'base-10' numbers rather than in binary. There were increasing problems in constructing the machine and it was abandoned in 1842. 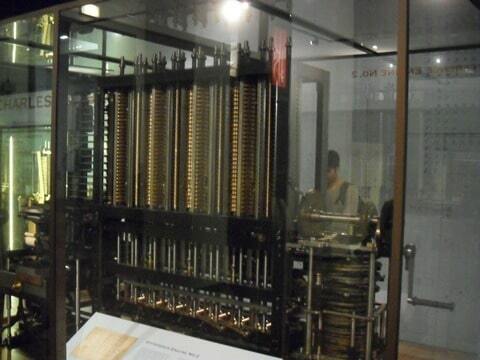 The difference engine was just a mechanical calculator, but Babbage also designed the so-called 'analytical engine' which would have had many of the features of a modern programmable computer - the program being coded on the punched cards used in the Jacquard textile loom. It can be argued that Babbage visualised a computer model not too far away from the 'Turing machine' model about 100 years earlier. Sadly, none of the Babbage machines were fully constructed during his lifetime - otherwise there might have been steam-powered digital computers in the middle of the 19th century ! 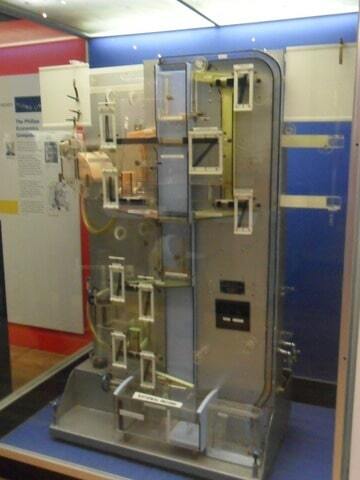 The Science Museum constructed the working 'Difference Engine No. 2' which is shown in the photo using Babbage's original designs. Construction took 17 years, but the final machine worked exactly as Babbage had intended ! 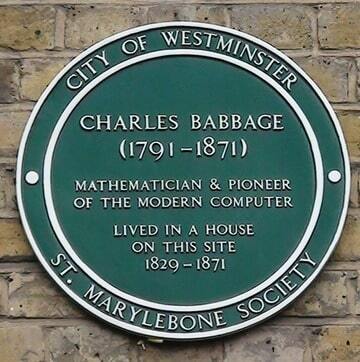 Plaque in honour of Charles Babbage in London. An explanation of Babbage's 'Difference Engine No. 2" and a demonstration of it in action. A mathematician, philosopher, inventor and mechanical engineer. This video is a demonstration of the second-ever difference engines to be built. It was made in 2008 at the Computer History Museum in California. The second item is the Phillips Economic Computer which is of the analogue type ie it uses physical models of the system to be analysed and, therefore, can't give very high precision results. Companies always refer to 'cash flow' and individuals often visualise 'flows' of money into, and out of, their bank accounts. This machine literally does this, using flows of coloured water between vessels at carefully-controlled rates to simulate changes in the system over time. For example, if more 'tax' water flows into the 'treasury' container than leaves it thought the 'expenditure' pipe, then the amount stored there increases and this shows increasing reserves. The machine was designed and constructed by New Zealand economist Bill Phillips and it was first demonstrated at the London School of Economics in November 1949. About 14 such machines were produced and they were used in universities to demonstrate economic theory, rather than trying to produce exact results. Such analogue models were replaced by digital computer modelling when more powerful computers became available in the late 1950s. Nowadays powerful computer models of the UK economy are used and some of these may be accessed for public use over the Internet ! I've attached a couple of videos from Youtube about this computer : one shows a close-up view of the machine and the other shows a machine in use - fittingly at the Reserve Bank of New Zealand. Here's an overall view of the layout of the Phillips economic analogue computer. Here's a demonstration of the operation of the Phillips analogue economic model.